The glorious opportunity to spend a whole afternoon drinking tea and eating cake was in celebration of a good friend's birthday (Happy Birthday for Tuesday, LT!) and I was also quite curious to see inside the ME Hotel, which has quite a prominent position on The Strand, close to Covent Garden and Waterloo Bridge. I chose the Palace Brew tea, which according to the tea booklet is, "a full-bodied and spicy blend of Assam, Nilgiri and Kenyan teas." I do like quite a strong tea, which I can then adjust to taste with milk, and this really didn't disappoint. The second pot was very gratefully received! As a coeliac, I of course had the gluten free option and, for the most part, it was very delicious. The sandwiches disappeared far too quickly, with the salt beef and pickle sandwich and the smoked salmon and cream cheese being particularly good. Some forward planning on my part meant I had saved these options until last (does anyone else do that with the items they're particularly looking forward to?!) and they were truly lovely. The scones were also wonderful - light and not too crumbly, which can be an issue with the gluten free version. The small pots of jam were just enough for the two scones, with a lavish amount of clotted cream. I always spread my jam first, then dollop the cream on top - it just seems to work better that way! My only criticism would be with the top layer because, as you can see, there were no cakes! 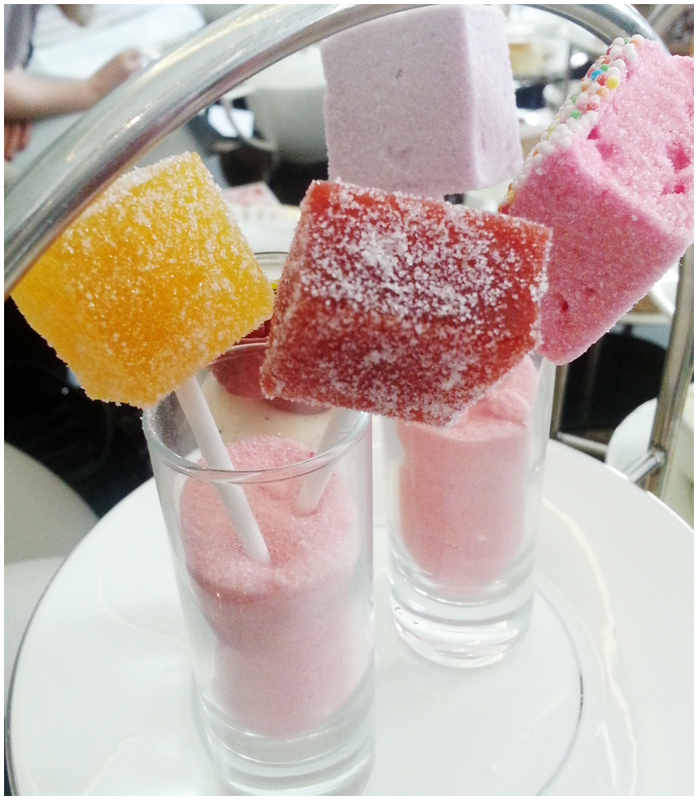 I was given a small cylinder of vanilla custard with raspberries on top, which is lurking in the back of the photo, and some fruit flavoured gummy lollipops and strange marshmallow creations, which were stuck in pink sugar. They were very pretty but incredibly disappointing and, considering how easy it is to make gluten free cakes (and good ones at that! ), a bit of a let down. The staff were all very friendly and attentive, without being overbearing. They started clearing away the bottom tiers of plates as soon as we'd finished them, which I found a little unnerving, but we didn't feel at all rushed other than that and we were able to sit and chat for a while after finishing. I find that very important after eating a lot of sweet treats - having to dash off would be disastrous! 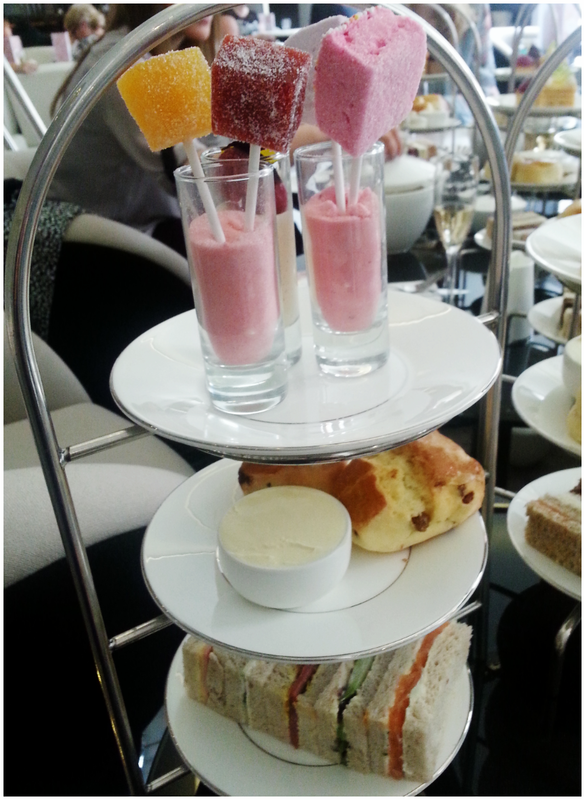 One difference to other places I've been for afternoon tea is that they didn't offer us additional sandwiches etc. afterwards. 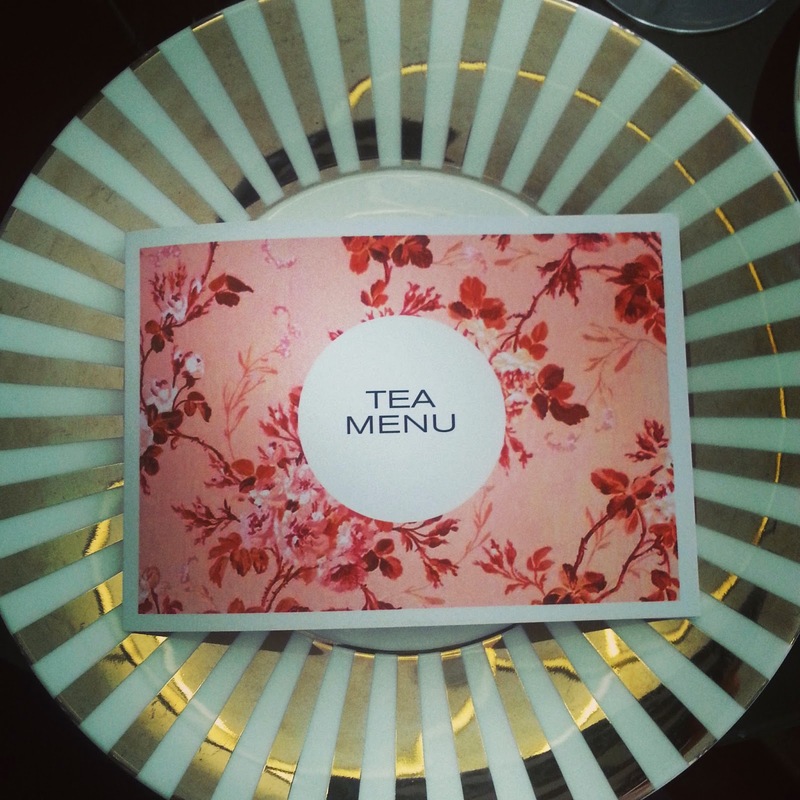 Going for afternoon tea is such a treat and often quite expensive, so it would have been nice to have been offered the chance for more of certain options. So, all in all, I'd give it a grand 3.5 stars out of 5 - lovely attentive service, delicious scones and sandwiches, but lacking an important element (in my case) for an afternoon tea. Coeliacs need cake too, you know! I didn't hear any complaints from the others though and their cakes looked wonderful, so I've included a picture of the gluten-filled afternoon tea too for your visual delectation. Hope you all have a lovely week-ahead - have some cake for me! Sounds like a wonderful time! 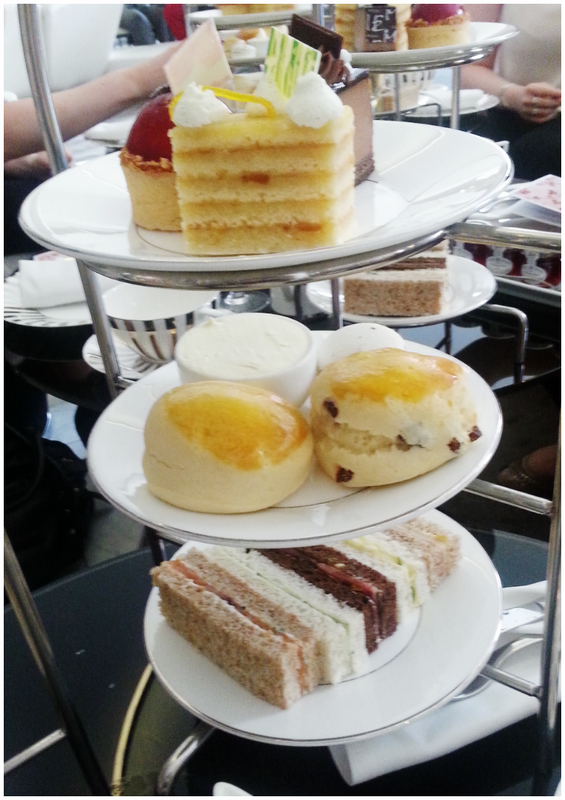 I really regret not making time for afternoon tea when I was in London, and I intend to remedy that the next time I'm there. :) I'm going to high tea at a lovely old hotel with my mother-in-law this weekend when we're in Canada, and I can't wait! You really must make time for afternoon tea on your next visit - it's quite a treat :) Enjoy your tea in Canada - how does a high tea differ from an afternoon tea?